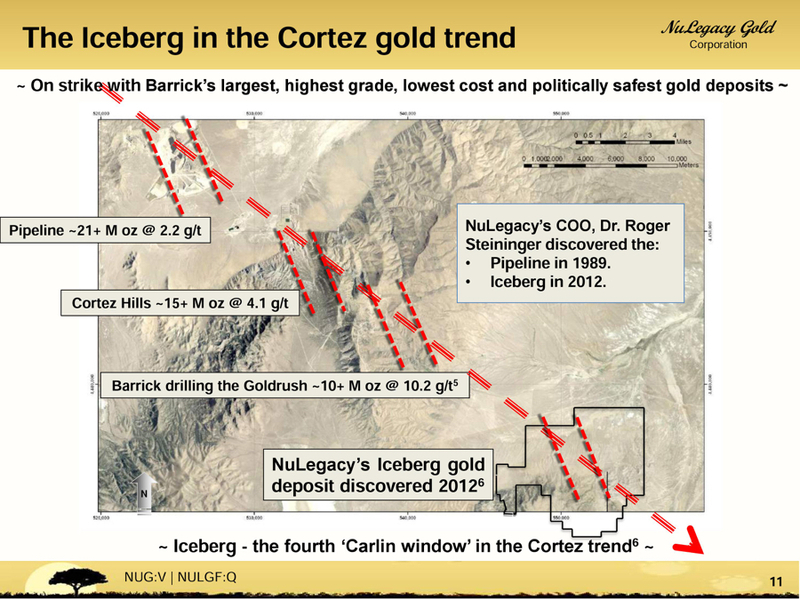 RENO, NEVADA--(Marketwired - July 15, 2016) - NuLegacy Gold Corporation (TSX VENTURE:NUG)(OTCQX:NULGF) is pleased to report it has now closed subscriptions for a total of 20,334,463 units at a price of C$0.30 per unit for gross proceeds of C$6,100,339 pursuant to its non-brokered private placement financing announced July 4 and 12, 2016. Each Unit consisted of one common share and one full share purchase warrant, with each warrant entitling the holder to purchase one additional common share for a period, subject to acceleration, of 18 months at an exercise price of $0.45. The net proceeds of the financing will be used to fund the Company's gold exploration programs and for general corporate purposes. Finder's fees of 6% cash and 6% finder's warrants were or will be paid and issued on approximately 16.5 million units to various finders including Sprott Private Wealth LP, Haywood Securities, Richardson GMP, EchelonWealth Partners and Mackie Research and all securities issued and issuable in connection with this financing are subject to four month hold periods expiring between November 14 and 16, 2016. The financing remains subject to the potential exercise of equity participation rights by certain existing shareholders as previously disclosed on July 4, 2016. Dr. Roger Steininger, NuLegacy's COO is a Certified Professional Geologist (CPG 7417) and the qualified person as defined by NI 43-101, Standards of Disclosure for Mineral Projects responsible for preparing and reviewing the scientific and technical information contained in this news release.